How to Use Parsley to Validate HTML Forms? For validating forms, you can configure all your validation rules right from DOM by using Parsley's data-parsley- DOM attribute. Please note that the library relies on jquery so you must load jquery before loading Parsley.js. Just download Parsley.js from here and move it to your application root. Load jquery & parsley in html form. 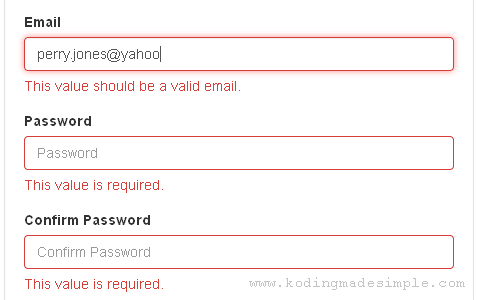 Then you must set validation rules to each one of the input fields. To make a field mandatory just use HTML5 required attribute or parsley's data-parsley-required. To validate an email field add Parsley DOM validator like this. To match the input with specific pattern, say you need the field to contain only alphabets use data-parsley-pattern attribute like this. Finally you have to bind Parsley to the form. You can do this in two ways. First one is by simply adding data-parsley-validate attribute to html form tag. And the second one is to bind via java script function. Now let's see a real world demo. 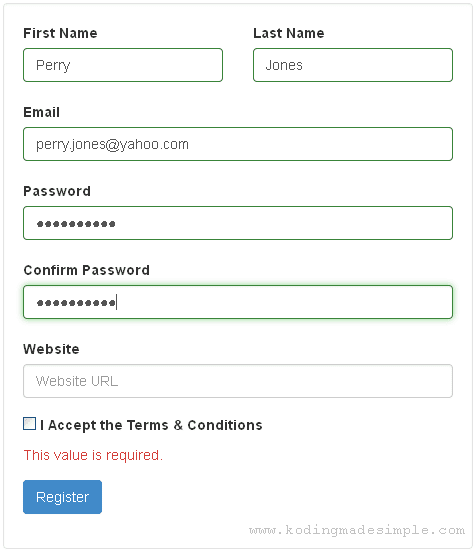 For this I'm going to create user sign up form, validate fields with parsley.js and if everything went ok use php script to insert user details into mysql database. I'm using php here but it can be any other server-side script. 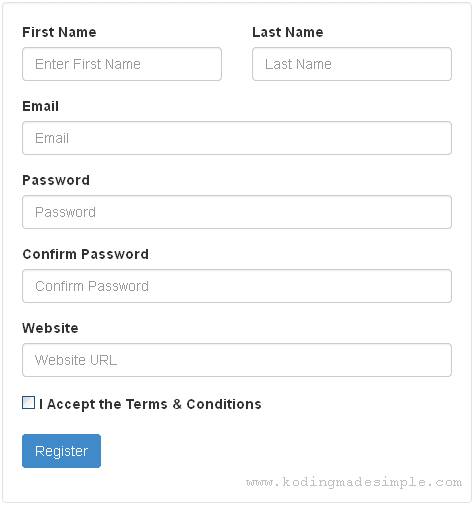 Then add php script to grab submitted form details and store it in database. And finally some css overriding. Parsley has its own css styling but since I have used bootstrap for form design I'm going to stick with it and override some bootstrap styles to color up the validation process. Since form fields are set as required you will get validation error if you submit the form without providing input for mandatory fields. And the data-parsley-trigger="keyup" attribute will trigger field validation as soon as you key-in input fields. If a particular field validation is met then the input box will turn into green. Once you input all the details and the parsley validation is successful, form will be submitted and the backend register.php script will take care of the rest of the registration process. Well! I've shown really a gist of what parsley can do. We have only used a handful of built-in validators but the library supports lot more than that and also let you craft custom validators of your own. Here are some of the most common parsley validators you'll need for form validation. data-parsley-required Makes input field mandatory. Similar to HTML5 'required' attribute. data-parsley-type="alphanum" Validates if input is a valid alpha-numeric string. data-parsley-pattern="^[a-zA-Z]+$" It validates if the input contains only alphabets. You can use any sort of regular expressions with '-pattern' attribute. data-parsley-type="url" It validates if the input is a valid url. data-parsley-length="[6, 12]" Validates if the length of the input is between minimum and maximum number of characters. data-parsley-range="[6, 10]" Validates if the input is between the minimum and maximum range. data-parsley-equalto="#somefield" It validates if value of the field matches with another field. This is quite useful in password confirmation type validation. data-parsley-trigger="keyup" It triggers the validation process on key up event. Parsley.js official site contains well-documented manual which you can use for learning more challenging functionalities. Once you get started it's quite easy to go with the flow. 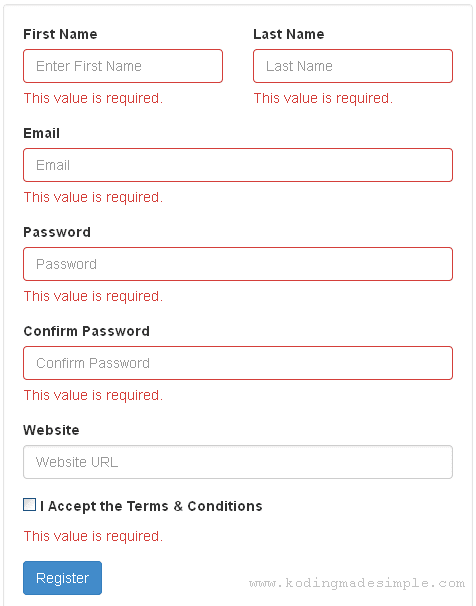 I hope you find this simple php form validation with parsley.js tutorial useful. Please don't forget to share it in social media. Meet you in another interesting tutorial.